Arizona State University has announced the launch of Workday, a new system that will consolidate purchasing, planning and budgeting processes into a single platform for ASU’s more than $2 billion knowledge enterprise. 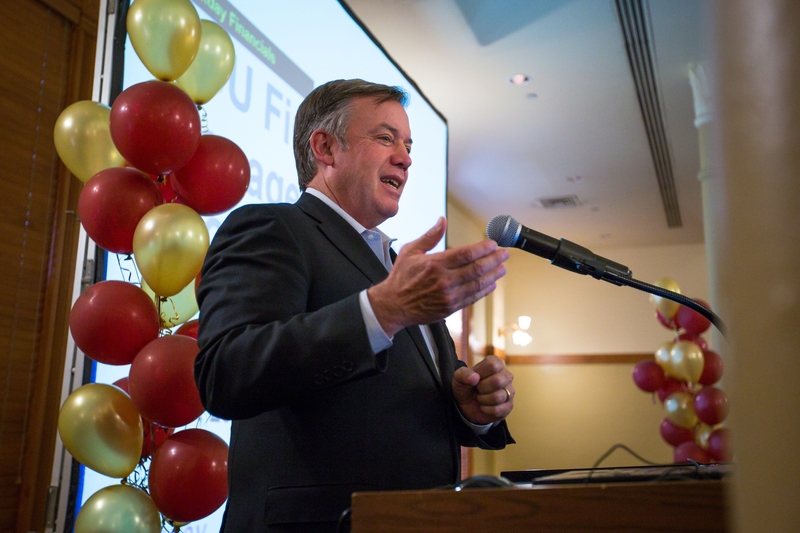 ASU President Michael M. Crow said the transition reflects the progress of an institution that, when he took office 14 years ago, handled revenue at a quarter of the current level, half of which came from the state. Crow emphasized that, as the state has reduced its financial support for the university over the years, ASU must adjust other aspects of its relationship with the state, pulling further away from the misperception of the university as a traditional state agency. “We are a servant of the people operating as a public enterprise,” he said. ASU has earned national acclaim for transforming how education is delivered — including technological advancements and studies across disciplines — as well as for upending decades of conventional wisdom and focusing on expanding access to education rather than elite acceptance rates. Now the university is revamping its financial infrastructure to mirror that adaptability. The new system consolidates multiple financial platforms into one and takes advantage of cloud storage and mobile apps to modernize accounting across five metropolitan Phoenix campuses and centers that span from California to Washington, D.C. This project will be staffed and managed by Financial Services, the University Technology office, Purchasing, the Office of Planning and Budget, Knowledge Enterprise Development, and various other subject-matter experts across campus. The system was selected several months ago after an extensive evaluation process that sought the best solution for a range of financial-management needs. Though previous programs were functional, vendor support had dwindled and finding staff with skills for outdated systems was becoming harder. For those who will be using the new system, there will be in-person training and online learning resources to ensure everyone is ready the moment the new system is live. Processes currently managed in Advantage, SunRise and STAR will be updated by this transition. The PeopleSoft Student and Human Resources systems will not be affected by the change, and neither will the University’s P-Card and MyASU Trip processes. For a preview of the system and what it looks like, visit the www.workday.com. ASU's Norman Dubie reads his poems and shares why poetry is so important today. The why's and where's of writing: Award-winning poet Dubie on his inspirations. The Regents’ Professor of English, who came to Arizona State University in 1975 to establish its creative writing program, has written poems since age 15, though his interest in them was sparked at an even younger age. At ASU, Dubie has taught hundreds of undergraduate and graduate students, formed a community of poets and been published widely. His work has been bestowed numerous accolades, including the PEN USA prize for Best Book of Poetry. In early June, he was awarded the Griffin Poetry Prize, an international recognition of the best book of poetry published in English, for his collection "The Quotations of Bone." Here, he talks about the importance of poetry and reads some of his work. Question: What has it been like since winning the Griffin Poetry Prize? Q: Why poetry? Why is it critically important in our lives today? A: A former student called me this morning explaining that he is suffering from stage II lymphoma and he was reading several poems of mine and that he was greatly consoled by them on a very difficult night when he couldn't sleep. That helps. It’s not a question of the art’s relevance, it's just how do you find enough time to really deal with the audience that's out there? … There are people out there who are completely taken up with language. It's our first resource almost after whatever is going on in terms of smart proteins inside our bodies. So, the writing of poetry is redemptive, and the reading of poetry is redemptive. [laughs] Propaganda, right? Q: Where do you write? Does your writing change when you change places? A: I write at a kitchen table. I'm from Vermont; the kitchen table was where the family gathered just to talk, to read magazines, newspapers, books. … I like to eat and so I write at a kitchen table, and I have my whole life, pretty much, but I can write in my head walking. I’ll give you extreme examples about place and writing for me. When I was first writing when I was a teenager, I started writing with the first snow there in northern New England. And I stopped when the lady’s slippers came up through the snow in April — so I was a seasonal writer. I was somewhat like that for a very long time. When I came here, I decided the summer was the winter. … Here in the desert I've written at night and very heavily between June and October. I'm also reading a biography on the poet Wallace Stevens, and I'm reading an old student of mine who has many books. I have several of her books open. Her name is Sarah Vap. She’s just brilliant, a wonderful poet. A: Once there was an expedition to West Africa — British 19th-century expedition — and they were approaching the forest and this pygmy elder came out of the forest and walked up to them and said, “There is a dream dreaming us.” He turned around and went back into the woods. And that's how I feel about life on this planet. I think in this creation we are immersed in an infinite mind.